Children are top of mind during this mid-February weekend in the West Island, as the various boroughs are organizing a variety of events catered specifically for the youngest among us. Of course, with Valentine’s Day fast approaching, it’s also a good time to show some love to the people closest to you! The fun begins this Friday, February 8th when the City of Beaconsfield hosts the WIBIT Ped Day. Excited young swimmers will receive the opportunity to navigate an inflatable obstacle course on water at the Beaconsfield Recreation Centre. Children must be at least six years old and 1.10m (3.6 ft) tall to participate, and those under eight must be accompanied by an adult. Admission is free for Leisure Card holders. Find out more on the event page. As part of the Dorval Winter Festival and the Family Morning Series, the City of Dorval is inviting kids and parents to attend the Fanfare Fanfaronne. 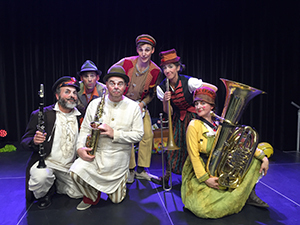 Head down to the Serge-Nolet auditorium at 1:00 PM to see a wacky band entertain with some funny and poetic bilingual dance music. This group will showcase some music from Brazil, Ukraine, and even the planet Mars! The show lasts 50 minutes and no reservation is required. Learn more by consulting the event page! Show the love this Saturday morning by decorating cookies with your family! The West Island Mommies are inviting young families to Plaza Pointe-Claire at 10:00 AM for a fun-filled morning of decorating cookies, drinking hot chocolate, face painting, colouring and even meeting Peppa Pig! No pre-registration is needed for this event; just show up at the door. The cost is $5 per child, and the name of each child that attends will be entered in a raffle to win a Little Mermaid DVD! Proceeds will support the Lakeshore General Hospital Foundation. Find out more on the event website, or on the event’s Facebook page.